Published: June 14, 2011 at 04:41 p.m. The Raiders have not had much success in recent years, but still managed to avoid this list. A recent topic on the Dave Dameshek Football Program revolved around the most hard-luck franchise to be born into. Because most of us root for the local team and can't help it if our local team is snakebit. A feeling I know all too well as a life-long fan of the Los Angeles Kings. During the conversation, I offered up the 49ers as one of the worst teams to be born into. Although, being a fan of the former Los Angeles Rams might have clouded my judgment. So I decided to break this thing down scientifically and objectively. I measured each team by the owner, city life, stadium, fans, weather, uniforms and history (on a scale of 1-5). And in fairness, the San Francisco 49ers avoided the bottom six (barely) thanks to the team history and being in arguably the greatest city in the world. 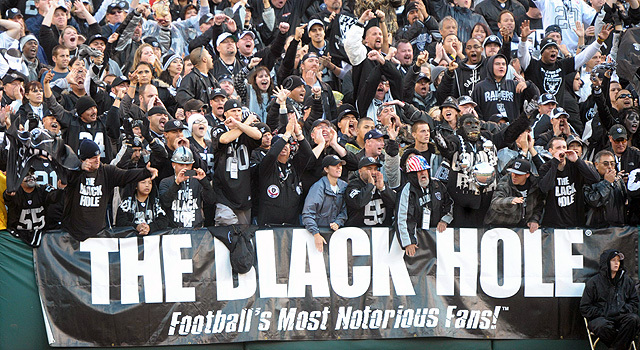 The Oakland Raiders also surprisingly avoid the list even though the stadium is awful and the fans stay away in droves. But history and weather are good. And both teams benefited from great uniforms. Oh yeah, the Jacksonville Jaguars also scored pretty high because of their fans (who I think are great), weather and city. It's not Miami Beach, but cheap beer and Lynyrd Skynyrd on the juke box ain't bad (and season tickets are affordable). Lions fans scored top marks, and despite years of losing, the Lions have some history with Barry Sanders and Bobby Layne. But what really hurts this team is the city and the weather. And an ownership that thought Matt Millen was a good idea. Plus, an indoor stadium? No roof would have kept the Lions off this list. The Vikings get very high marks for city life, but that stadium is an absolute zero. Even Mother Nature tried to rectify this by ruining the Metrodome's roof. But until this team gets a new stadium -- in Minnesota, not Los Angeles -- this team is going to remain here but with a chance to move up. I had to go back and recalculate the numbers a couple of times to make sure that this was right. While Nashville is a great town, there isn't much known about the Titans' fan base. Plus the history is rather shallow, being in Tennessee for just a short time (Oilers history doesn't count here). And any owner that relocated a team gets dinged. Good fans, good stadium. Especially since the stadium is outdoors as the football Gods intended. But despite two Super Bowl appearances, there is a history of losing that is too long to ignore. Plus you can't blame the Bengals for wondering if their ownership is committed to winning, especially when Carson Palmer would rather retire than play for the Bengals. The Bills received the highest marks for owner (I mean, he's in the Hall of Fame) and the fan base. I even like Buffalo as a city (very underrated). But the weather and stadium hurt here. History is actually pretty good despite losing four Super Bowls. But with a game played in Toronto each season, that docks some points. A return to the old-school uniforms keep the Bills from No. 1. A potential return to Los Angeles hangs over this team's fans like the Sword of Damocles. The dome received the lowest marks because it has become obsolete and can trigger the team getting out of its deal in 2014. But here was the kicker that pushed St. Louis over the top: At the end of the day, are St. Louis fans more worried about losing the football club or Albert Pujols? Exactly. Check back tomorrow for the best teams to root for. And just in case Adam Rank didn't see your mean comment below, you can also reach him via Twitter. "Pick Six: Best franchises to root for..."